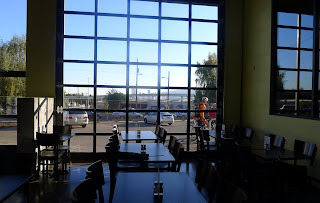 When I last visited the site that was to become Ecliptic Brewing, the building was nothing more than a shell. This was in late April. Brewer and proprietor, John Harris, raised some eyebrows, including my own, when he talked of opening in October. Yet here we are. 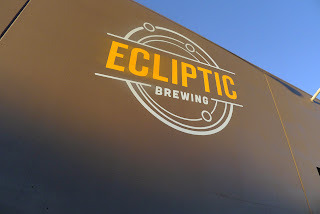 Ecliptic officially opens today. Just to review, Harris is one of Oregon's iconic brewers. He started out at McMenamin's Hillsdale Brewpub in 1986. Two years later, he moved to Deschutes in Bend, where he developed beers like Mirror Pond, Black Butte Porter and Obsidian Stout. In 1992, Harris returned to Portland to run Full Sail's brewery on the South Waterfront. He left there last year to start his own gig, Ecliptic. Members of the so-called beer media toured the Ecliptic facility Sunday afternoon. It is impressive, even if it is a work in progress. 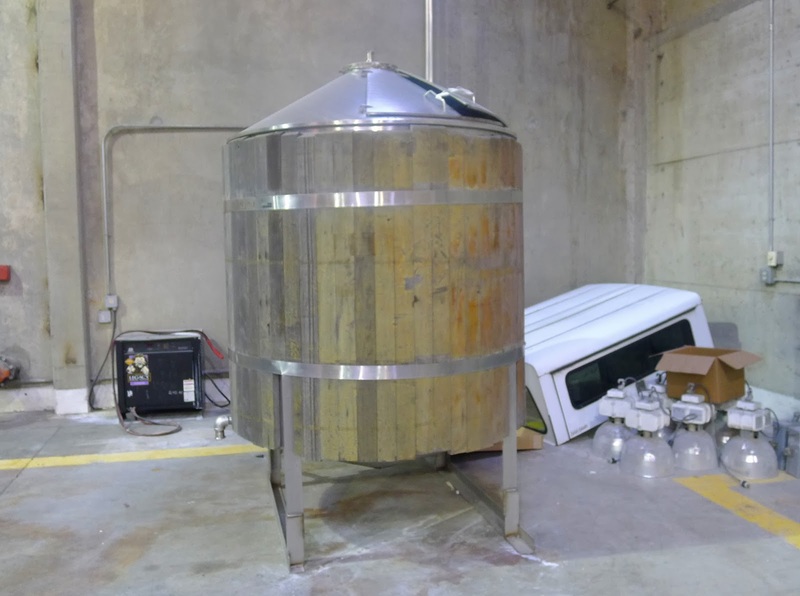 Harris put together what he willingly describes as a "Frankenstein" brewery...so named because it is composed of pieces scavenged from all over. It's a 15 bbl system with three fermenters...one 15 bbl and two 30 bbl. Several conditioning tanks complete the line-up. Some expected to see Bridgeport's original brew kettle in the middle of the brewery. John acquired the old steam-heated kettle from Dogfish Head in Delaware, but discovered the old vessel needs some fixing. He subsequently acquired a more modern kettle from Japan. No word on what will happen to the old Bridgeport kettle, which has significant historic value in Portland. Perhaps a display of some sort. A word about the theme here. Ecliptic's is all about astronomy. We're talking stars, not horoscopes, if you're wondering. Harris has combined his two passions here...brewing and astronomy. 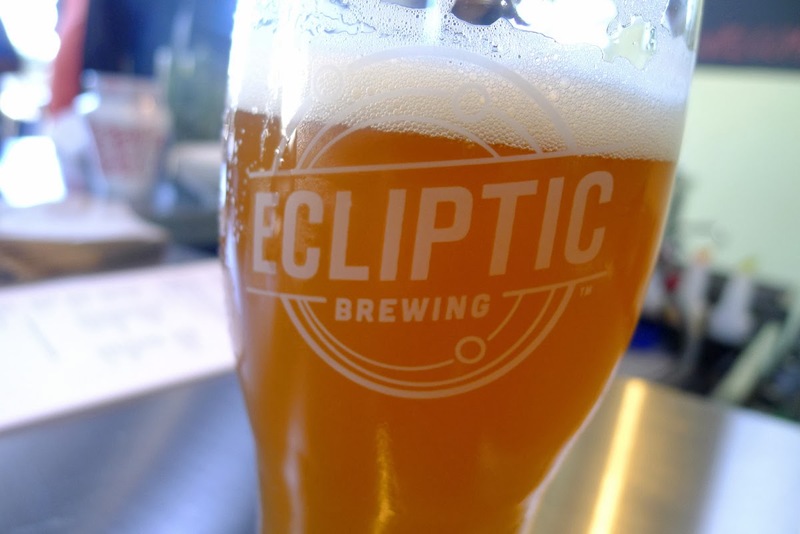 Ecliptic represents the Earth's yearly journey around the sun. They actually have a sizable light fixture that mimics that path. 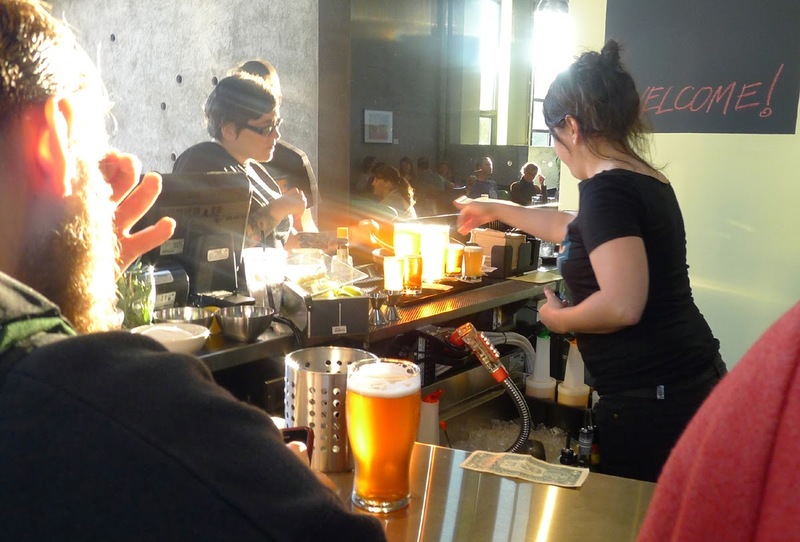 The movement is reflected in the beer list and menu items, which will rotate with the seasons. No standing still here. Procyon Pale is adequate, if a little dry. It has great color and clocks in at 5.9% ABV and 60 IBU. It could use a touch of sweetness, in my view, but many will like this beer fine as it is. The IBUs are a little higher than what Harris intended, he said. That will get dialed in as he tinkers with the recipe. Arcturus IPA is made with a mix of "C" hops (Cascade, Centennial, Chinook and Columbus). It clocks in at 7.4% ABV and 75 IBU. This is a decent IPA and will surely be better with tweaking. Arcturus is not dry-hopped, which means it lacks the nose most Portlanders expect in an IPA. Still, pretty good. The other two beers are collaborations, one with Gigantic Brewing and the other with Widmer. The Gigantic beer, TicWitTic, is a Belgian-style Wit that is soured. The Widmer beer is 1/2 Mile Pale Ale (Widmer and Ecliptic are half a mile apart). I didn't taste either of these beers, so I can't comment. The TicWitTic sounds fairly interesting. Must make a return trip. Food isn't going to be an afterthought here. Harris says there's no reason why a brewpub can't be listed among the best restaurants in the city. He may be right. Regardless, he aims to offer a rotating menu of stellar items. Sure, you'll find burgers and standard pub fare. But you'll also find pan-fried black cod, ale-braised lamb shank, grilled flat iron steak and more. Appetizers, too. 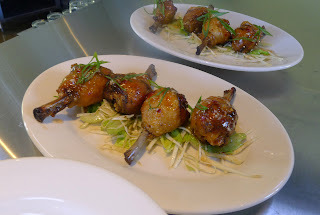 Don't miss the sweet and spicy drumsticks! Besides the food and brews, there's other good news here. Located just a block south of Fremont on Mississippi, Ecliptic features nice views of the city through large garage doors. The doors will be shuttered most of the winter, but the views remain. By next summer, Harris will have an outdoor patio to supplement the space. Chain link fences lining the property will be gone by then. Perfect. 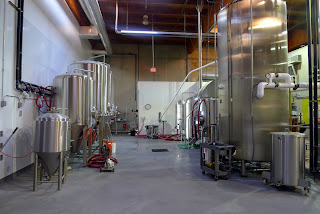 Back in the brewery, there's a lot of unused space...by design. 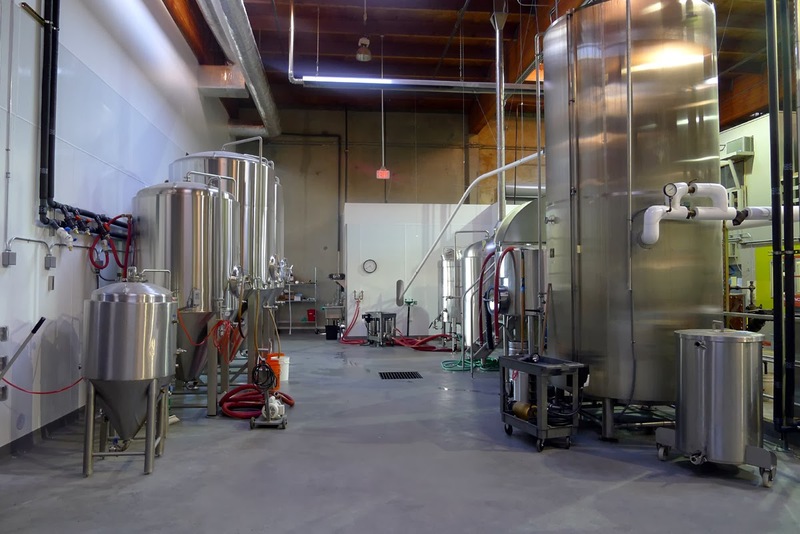 Harris expects to expand the brewing system as business grows and will add a barrel program as well. He has plenty of room to do so. He also hopes to release his beer in bottles (or cans) at some unspecified point. There's space to install a bottling (or canning) line if he chooses. Smart move. Of course, you never know how a new business is going to do until you see it in action. Harris definitely has the knowledge and experience needed to run a prosperous business. This location is nearly ideal in my mind., but consumers will vote with their dollars on that. I suspect Ecliptic has a bright future.